Organizers of a petition demand a moratorium on large aquaculture leases while additional rules are drafted. Lobstermen are among the organizers of a citizen petition asking the state to limit where new aquaculture operations are sited in Maine’s coastal waters, claiming the surge in new licenses affects where they can drop traps. A wave of aquaculture operations has swept along the coast in the last few years, sparking concerns from lobstermen and others about waterfront access, aesthetics and interference with commercial fisheries. A 40-acre oyster farm proposed in Maquoit Bay in Brunswick by Mere Point Oyster Co. is a flashpoint in the debate. The hearing on its application prompted three days of prolonged, contentious discussion, involving landowners in the upscale neighborhood of Merepoint, members of the town’s fishing community and others. “I’m here to let the Department of Marine Resources know that their system of granting aquaculture leases is broken or, even worse, non-existent, as far as it pertains to the commercial lobstermen in this state,” John Powers, a lobsterman who has fished around Brunswick for 40 years, said at a news conference in the State House on Wednesday. Powers was among a handful of organizers who submitted a petition with 189 signatures to the Department of Marine Resources, almost 40 more signatures than needed to trigger the rule-making process. The department’s current aquaculture evaluation process includes making sure a new lease will not unreasonably interfere with navigation, waterfront access, fishing or other uses of the area, result in unreasonable noise or interfere with wildlife and marine habitat. Petitioners want an immediate, statewide moratorium on pending lease applications bigger than 10 acres. A map of the state aquaculture operations shows several larger than 10 acres, but a DMR spokesman was unable to provide an exact number. They also want the state to add rules that would allow it to consider whether a nearby location or different lease boundaries would better balance competing water uses. The group wants its rules to be retroactive to the pending Mere Point Oyster Co. lease application. “I ask the DMR to listen carefully to the generations of men and women who have made the lobster industry what it is today and protect our livelihood from what has become nothing more than a land grab in upper Casco Bay,” Powers said. Julie Eaton, who fishes for lobster out of Stonington and is head of the Maine Lobstering Union, worries that rich people from out-of-state would use big aquaculture leases to deny ocean access to people who have relied on it for decades, specifically the lobster industry, Maine’s most valuable fishery. “It’s time for thoughtful reconsideration of the rules to protect one of Maine largest industries – the lobstering industry,” Eaton said at the news conference Wednesday. But Sebastian Belle, executive director of the Maine Aquaculture Association, said the petition is just a smokescreen to drum up opposition to the Mere Point project. New leases are already prohibited from places with active commercial fisheries under current law, he said. The petitioners are using a few local fishermen to mask opposition to the Mere Point Oyster Co. project from a local landowner concerned the project will ruin his view, not fear it will affect the fishing industry, Belle added. A Department of Marine Resources spokesman said the state must first confirm the petition complies with Maine law, and if it does, the state can begin the rule-making process within 60 days. Dan Devereaux, Brunswick harbor master and a partner in of Mere Point Oyster Co., said the company picked its site specifically because it did not conflict with lobstering or other fisheries. The company also has shrunk its active area to about 28 acres and agreed to have east-west and north-south corridors to allow other fishermen to access the site, Devereaux said. The driving issue is coastal landowners concerned with losing their views, not threats to fishermen, Devereaux added. “Trying to package it up and couch it with creating fear from lobstermen that we are taking over the waters is ludicrous in my opinion,” Devereaux said. Mere Point’s lease application went through its public hearing process this winter and awaits a final decision from the Department of Marine Resources. If the lease is approved, Mere Point Oyster Co. plans to grow from 350,000 oysters this year to 1 million in 2021. “It’s too bad, it seems like the beef is with Mere Point Oyster Co. and the rule change they are asking for would impact aquaculture development up and down the coast of Maine,” Devereaux said. Aquaculture is regarded by many as a crucial way to preserve and grow Maine’s commercial fisheries in the face of rapid changes to the ecosystem like warming sea water and ocean acidification that threaten natural stocks. In the past five years, aquaculture operations have blossomed along the Maine coast. The Department of Marine Resources approved an average of 17 new leases a year in the last five years, compared to six leases approved a year on average from 2009 to 2013, according to a review of department lease decisions. American oysters have emerged as the pre-eminent crop for new aquaculture companies. Oysters grown in Maine waters are highly sought-after by chefs and restaurants across the U.S. and Canada, and fetch higher prices than those from other parts of the country. 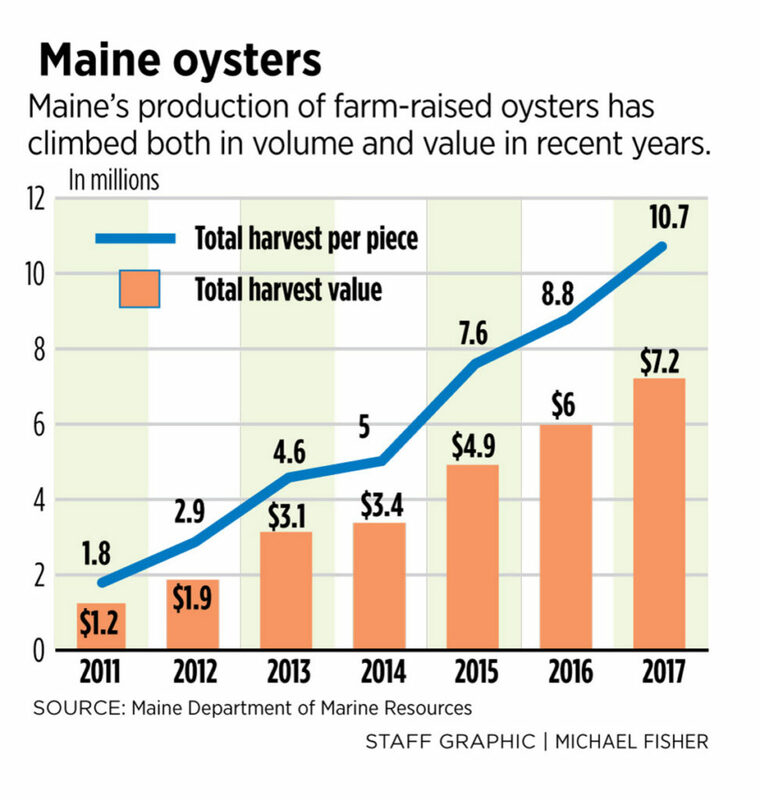 The value of Maine’s farmed oysters more than doubled in five years, from about $3.1 million in 2013 to $7.2 million in 2017, according to state records.